In honor of The Bear’s birthday, we trundled off yesterday to see The Livin’ Large Lizard’s Latest Legend. There are numerous reviews out there for you to peruse if you are insufficiently familiar with The Large One. This latest installment does not fail to do the series justice. Following the film – I know a tough act to follow – it was time for the birthday dinner. The original plan was to attend the North Florida Food Truck Cook- Off at The Landing on the river in downtown Jacksonville. Unfortunately, sore backs precluded this idea, no matter how much we wanted to try the shrimp tacos from the number one food truck in J-Town – On the Fly. Plan B had better be good, and it was. We all piled into the car and headed out to the Beach to Culhanes’ Irish Pub and Grill. Earlier in the week Yak 6 had seen the restaurant on a rerun of Guy Fieri’s Diners, Drive-Ins and Dives and the Birthday Bear decided he wanted to scope it out. Disappointed in missing the Food Truck Contest, it turns out, we were not. Atmoshere, service and food were all top-notch. 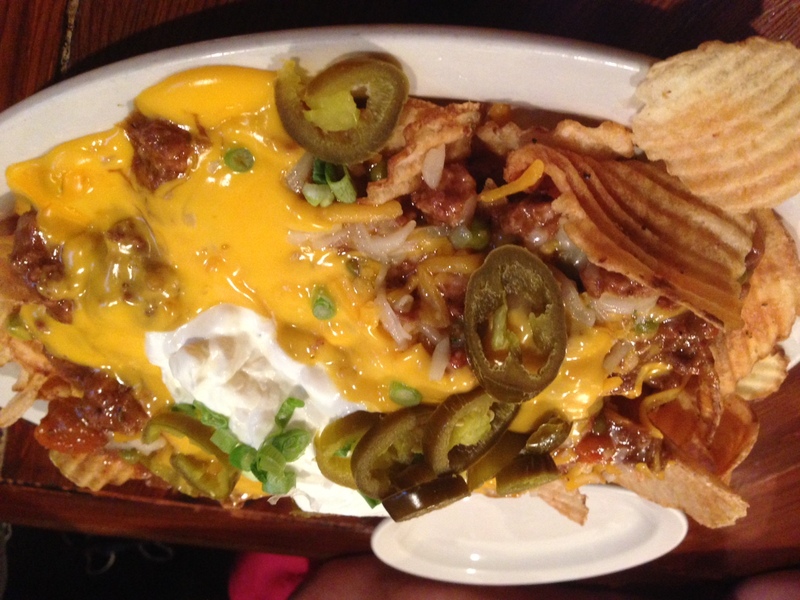 Crispy crinkle cut chips loaded with “SWEET” Shepherd’s pie, queso, shredded cheddar cheese and topped with jalapenos, scallions and sour cream. Enough to feed an army! These were over the top delicious, with homemade (we think) potato chips instead of tortilla chips and their Shepherd’s Pie instead of chili. However, the shepherd’s pie looks and tastes a lot like a sweet chili. Mouthwatering! 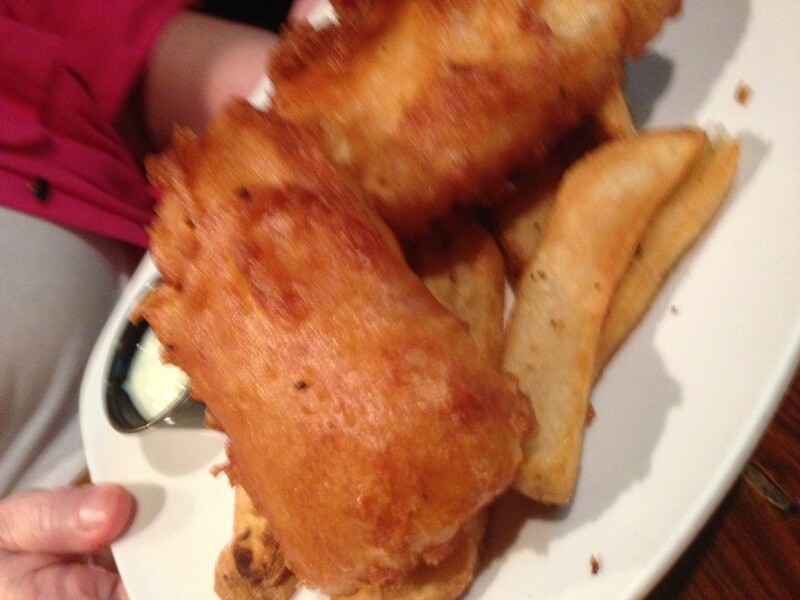 Fresh Atlantic cod dipped in beer batter fried in peanut oil to a crisp perfection. Served with seasoned fries, tartar sauce & lemon wedge. The menu proudly claimed these to be the best in town and we would be hard pressed to argue with them. The fish was perfectly done, not greasy and very flavorful. The “Chips” were good sized, slightly seasoned and fried just right. 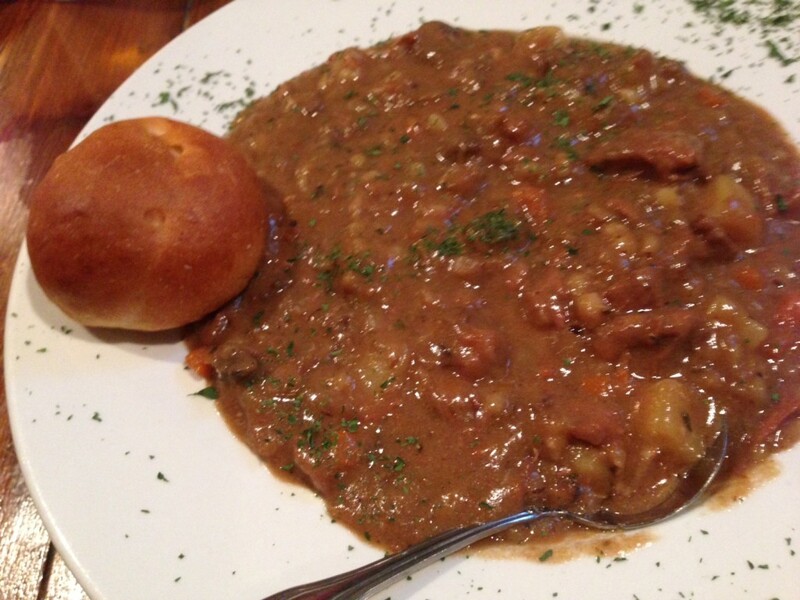 Certified Angus Beef braised in Guinness beer and slow cooked with barley, baby portabellos, carrots, onions & diced potatoes in a savory gravy. Even though it was not a cold winter’s night in the River City, this tasty dish sure warmed the belly and put smiles our faces! Baby Back Ribs Marinated in Bourbon, Guinness, herbs and spices slow roasted to fall off the bone tender. 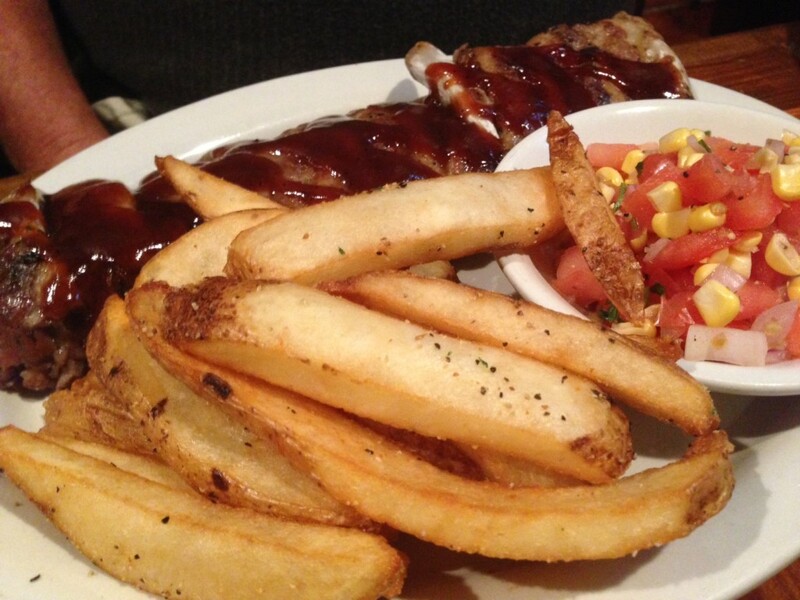 Served with seasoned steak fries and collard greens. Note that I substituted the collard greens with corn salsa. They were not kidding about “fall off the bones tender” – when I went to slice off a couple of ribs for the Birthday Bear, they literally separated as soon as my knife touched one of the ribs. These were the best ribs I have had in more than a few years! The corn salsa was well received – tasting very similar to Yak 6’s recipe, minus the black beans. The steak fries (“Chips”) I thought were just right, but the Birthday Bear would have preferred just a bit less spices. After the main courses were devastated, Jenny (our server) recommended the bread pudding for dessert. She was right – it was delicious. Unfortunately for posterity, no photo was taken, but it was of good size, with whipped cream on the side, and a large scoop of vanilla ice cream mounted on top. Here at Yakhuset we are always looking for ways to enrich our culinary awareness, regardless of the source. Many an hour has been spent drooling over recipes being prepared by the legion of Food Network™ Stars, some of which have even made it to the Yaktable. Reconnaisance missions (to local restaurants) also provide us with ideas. Hence, a lucky drive-by sighting of a new eating establishment (Hawkers) in the historic Five Points neighborhood of downtown Jacksonville a week ago called for a reconnaissance in force this weekend. So Yak 6 and I met the Bear (younger son) there at 1pm this afternoon. 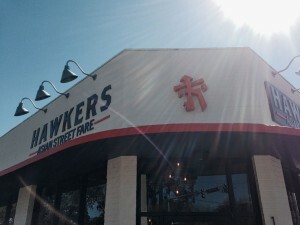 Hawkers Asian Street Fare opened eight days ago and the word has obviously gotten around since we had to wait 25 minutes for a table. Hawkers are street vendors (food) in Asia and that’s what this restaurant specializes in. It reminded me of Singapore’s melting pot of different cultures and foods, with dishes from China, Japan, Korea, Malaysia, and Thailand. It proved to be worth the wait! Both the wings and the skewers were grilled over wood coals and they were outstanding! The Pad Thai dish was an excellent example of its kind, but if you don’t like or are allergic to shrimp, you might want to ask if they can do it without. We were also pleasantly surprised by a complimentary order of their Southeast Asian Chicken Curry, which was outstanding! The Bear ordered Vietnamese coffee and Yak 6 ordered their Thai tea, both of which were very good. Later we shared both their flan special and their Rodi desserts. Although we liked both, the Roti and ice cream, dusted with cinnamon was the clear winner. We were very impressed with the quality of the food, service and atmosphere – it made for a perfect Saturday afternoon meal. Prices were reasonable, with most dishes in the $5 range. 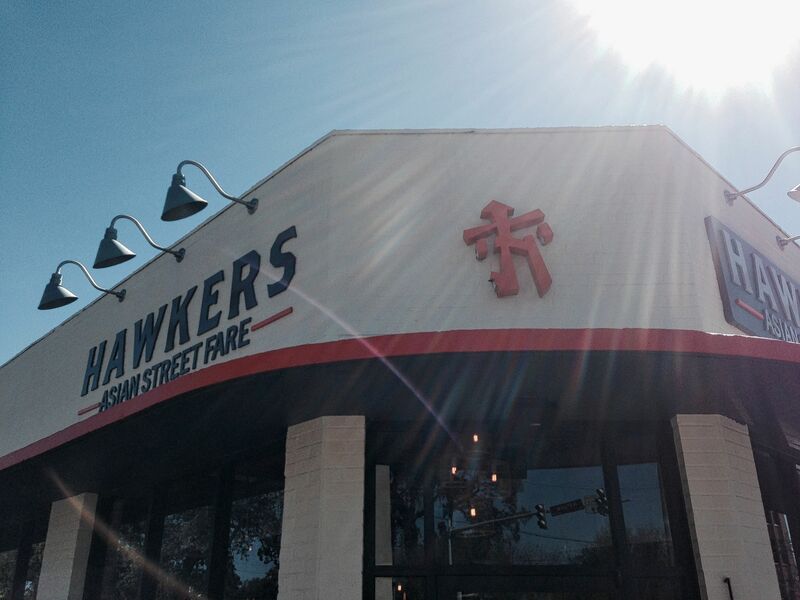 Yelp reviewers (21 of them) have given Hawkers in Jacksonville a 5/5 star rating – and we couldn’t agree more!